In the aftermath of a storm that devastated Puerto Rico, Golden Eagles support teammates from the island and rally to a winning season. From left: Karla Santos, Jeshmaire Suarez and Alejandra Negron. 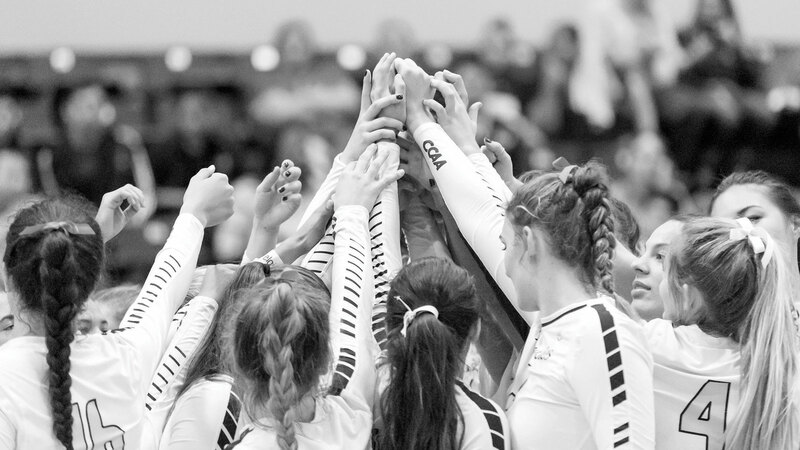 The California State University, Los Angeles women’s volleyball team was on the brink of defeat, but outside hitter Karla Santos remembered why they were playing. Santos was raised in the seaside city of Manatí in Puerto Rico. Her childhood home, about 30 miles from the capital of San Juan, was destroyed when Hurricane Maria tore across the island in the fall. She and her teammates dedicated the Sept. 23 match against Cal State Dominguez Hills to Puerto Rico. “To play and win. I think that’s the only thing that I can do for my island, to support my island and my family,” Suarez said after the game. Puerto Rican roots run deep on the team. 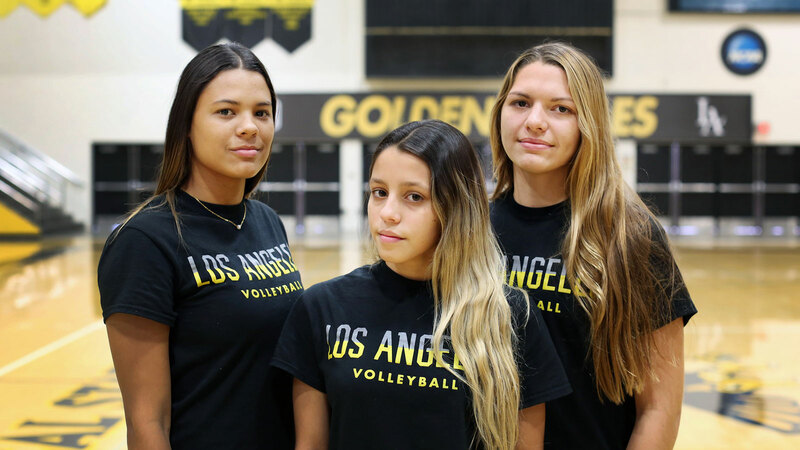 Head coach Juan Figueroa, outside hitter Alejandra Negron and libero Jeshmarie Suarez are all from the island, which is still suffering catastrophic devastation in the wake of one of the most powerful storms to ever strike the U.S. territory. The Golden Eagles were down two sets to the Toros, and Figueroa gathered his players. They reminded each other that this was not just another game, and they remembered why they were there. First-year player Santos ignited the comeback with one of the greatest performances in Golden Eagles volleyball history. She recorded a season-high 30 kills and 26 digs. Cal State LA went on to take three straight sets and win the match. Santos’ performance earned her CCAA Student-Athlete of the Week. At a time when it was difficult for the players and coach to focus on volleyball, their driving force came from the emotions fueled by the disaster. Inside the locker room, the players cried and hugged each other. Negron, who is from Bayamón, which is in a valley about 10 miles from the capital, reflected on the destruction across the island. “It’s really bad. All the trees are down and you can see everything,” she said in the days following the hurricane. “I feel so bad because I can’t do anything,” Negron adds. She, Santos and Suarez talked to their families, but the conversations were brief due to the downed power lines and cell towers. Figueroa, who is from the San Juan suburb of Levittown, said the tragedy brought the team together. Players have rallied around their Puerto Rican teammates as they struggle to cope with the crisis and communicate with their families. Cal State LA continued to rally to their 21st consecutive winning season. The Golden Eagles reached the semifinals of the CCAA Championship Tournament as the South Division’s No. 4 seed. Santos finished the regular season second in the conference in kills, with 339, and in points, with 376.5. She led the Golden Eagles in kills, points, service aces and was second in digs. Her outstanding performance this season earned her All-CCAA First Team, CCAA Freshman of the Year and American Volleyball Coaches Association Division II West Region Freshman of the Year honors. Office of Communications and Public Affairs 5151 State University Drive.